India begins elections for its lower house on April 11. This will be the world’s largest democratic exercise, and will last through May 19, with ballots counted on May 23. I had the chance to ask Dr. Tanvi Madan, director of the India Project and fellow in the Project on International Order and Strategy at the Brookings Institution, as well as author of the forthcoming book Fateful Triangle: How China Shaped U.S.-India Relations During the Cold War, about the role and importance of national security issues in Indian elections. Our exchange appears below. We are used to thinking about Indian elections revolving around bread-and-butter development issues. 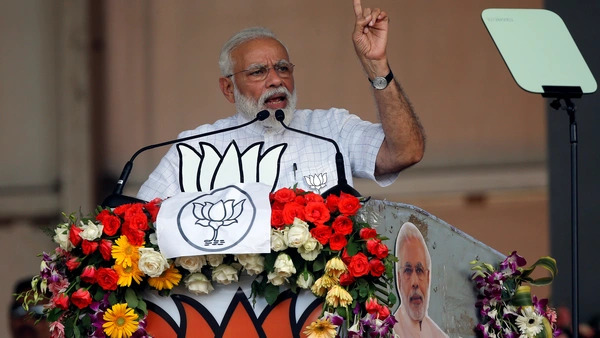 But given the recent India-Pakistan tensions, it looks like Prime Minister Narendra Modi is bringing national security into his campaigning. How much have national security issues resonated with voters historically—or at least how much do we know about that with previous elections? We do know that elections affect Indian foreign and security policy. For example, they have an impact on defense spending and trade policy. However, it is difficult to make definitive statements about the reverse—i.e. the effect of national security on voting behavior. Some cite the Bharatiya Janata Party [BJP]–led government’s “surgical strike” across the line of control in Kashmir in 2016 as benefiting the party in the 2017 state elections in Uttar Pradesh [UP], but it is difficult to disaggregate the impact of that from other factors. Further back, the 1971 India-Pakistan war came after Indira Gandhi had already made gains in the general election earlier that year. Her party did make gains in the state elections held in 1972, including in head-to-head contests with the BJP’s predecessor, and the war did significantly contribute to her image as a “strong” leader. In terms of recent crises, the October 1999 general election took place three months after the Kargil crisis. The BJP-led coalition returned to power, but the party did not gain additional seats and lost vote share. Both of these could be attributed to the party contesting fewer seats, but its seat tally in its stronghold of UP was also halved. What we do not know is whether the party would have suffered greater losses had the Kargil crisis not happened. The 2009 general election took place less than five months after the 2008 Mumbai attack. The opposition criticized Prime Minister Manmohan Singh’s [Indian National] Congress party–led coalition government for not retaliating. Nonetheless, the coalition was reelected, with the Congress party winning an additional sixty-one seats. However, these instances might not be predictive of the impact of national security issues in the upcoming election. This poll takes place just a few weeks after the India-Pakistan crisis, while the 1999 and 2009 elections took place a few months after the crises, by which time it is possible the effect dissipated. Why do you think Prime Minister Modi has been highlighting the national security element during the campaign? Whether or not it drives votes, the Indian Air Force [IAF] strike in Balakot after the Pulwama terrorist attack has helped shift the campaign narrative—and potentially the momentum. After the Congress party had made gains in recent state elections, the BJP was on the back foot. While the general election was still considered Narendra Modi’s to lose, criticism about his government’s economic performance dominated the discourse, as did the question of whether or not he had delivered on the promise of acche din (good days). With the IAF strike, as well as an anti-satellite test, the BJP has gone from playing defense to offense, arguing that it has delivered on the international element of acche din. The party has cited both of these developments as demonstrations of strength. And BJP leaders have used them in both “hope” and “fear” arguments: on the one hand claiming that they have gained India respect on the world stage, and on the other suggesting that Modi is the indispensable chowkidar, or “guardian,” and—in an après moi, le deluge sense—that India’s security would be threatened without him. At the very least, the BJP will be hoping that the national security case helps drive turnout, counters the anti-incumbency factor, or gives voters unhappy with the party for nonperformance in other arenas a permission slip to vote for it. The party will likely also hope that this focus can help deflect the Congress party’s attacks on the BJP for not doing enough to build security capabilities or to counter China. Unlike during the 2014 campaign, Modi has himself not targeted Beijing during the campaign and instead has sought to stabilize relations with China over the last year. How do you view foreign policy and national security across India’s various political parties? Are there strong commonalities—a core set of principles that transcend parties, or are there differences among parties? The general trend of foreign and national security policy has tended to be fairly consistent. For example, India’s diversification strategy—i.e. maintaining a diversified portfolio of partners while avoiding alliances, in part to preserve as much as decision-making space as possible—has found support from major political parties. Leaders since Jawaharlal Nehru have emphasized that foreign policy needs to serve domestic objectives first and foremost. And while opposition parties do criticize many foreign policies, they often end up following them when they find themselves in office. The BJP has tended to portray itself as more hawkish on foreign policy, and criticized the Congress party for taking a softer approach toward China and Pakistan. But it, too, has made overtures to both countries when in power. Parties have sometimes emphasized different countries or issues. The BJP, for instance, made clear that it would bring India’s relations with Israel out into the open. It also highlights cultural and diaspora elements in foreign policy in different ways than the Congress party. Rhetorically, it has sometimes suggested a more assertive approach towards building partnerships and capabilities, but its track record has not matched that—arguably because there are different views within the party about India’s strategic and economic engagement with the world. India’s regional parties, in turn, pay attention to other specific issues. How do foreign policy priorities show up at the subnational level—are there some states or regions for which foreign policy matters more than others? The subnational level matters because, for one, parties operating there are key to coalitions at the center. Border states in India have tended to care about foreign policy issues related to the nearest neighbors for various reasons. For instance, Tamil Nadu takes an interest in developments in Sri Lanka, especially the fate of Sri Lankan Tamils. States bordering Nepal take an interest in political developments in that country. West Bengal has watched relations with Bangladesh closely in order to guard its territorial and water rights. Assam and some of the other northeastern states care about the impact of policy toward Bangladesh on migration. Thus, one thing to watch is whether and how the Citizenship Amendment Bill that the BJP supports might affect votes in this region where the party has sought to make gains. While many of the party’s supporters back it on religious grounds, there have been protests that the bill will change the ethnic makeup of the region. Also in the northeast, Arunachal Pradesh does follow carefully the state of relations with China. Similarly, Jammu and Kashmir’s interests are implicated in relations with Pakistan. There are other foreign policy elements that affect interests at the subnational level, but we do not have definitive evidence of their impact. These include economic policy. Some states, particularly in India’s south, have benefited significantly from more liberal trade and investment policies. The approach toward the safety of the diaspora, which contributes remittances, is another element that particular states might care about. For instance, Kerala sends thousands of workers to the Middle East, and Andhra Pradesh and Telangana send thousands of students to the United States—some of whom were recently arrested for enrolling in a fake university. Finally, while we do not know how it affects voting behavior, it is worth noting that a significant number of soldiers in India’s military and paramilitary forces come from states in India’s electorally crucial northern belt. Do you see prospects for change in the trajectory of U.S.-India relations depending on the election outcome? Over the last two decades, there has been more continuity than change in the trajectory of U.S.-India relations across BJP and Congress party-led governments. Structural realities—and the need for the U.S. as a security and economic partner—have meant that parties in power have tended to favor closer U.S.-India ties, even if they complain about them when in opposition. The BJP, for instance, opposed the nuclear deal when in opposition, but the government it has led over these past few years has supported closer defense cooperation with the U.S. The Congress party, now in the opposition benches, has looked askance at some of this, but, when in power, the government it led had signed a number of defense deals with the U.S., and initiated both a trilateral with Japan and the quadrilateral that also included Australia. The election outcome could affect the pace of the U.S.-India relationship. Much will depend on what policies a new government follows with regard to defense and trade, as well as vis-à-vis third countries like China and Russia. If a new government takes a protectionist economic line, does not follow through on building defense capabilities, doubles down on defense deals with Russia, or pursues a more substantive reset with China, then it could lead to divergence or friction in the U.S.-India relationship. There are other factors that could shape the relationship—and even change its trajectory—including India’s links with Iran and Russia (and even Venezuela), and whether or not it finds itself subject to associated U.S. sanctions. Also crucial will be whether there is a U.S.-China trade deal and whether it serves to alleviate competition between those two powers—that will fuel Indian concerns about American reliability or a U.S.-China condominium. One unknown is if a coalition government results from the Indian election that is more like a third front rather than a BJP- or Congress-led coalition. In that case, many expect the permanent bureaucracy to be the crucial actor—that would lead to continuity but also, perhaps, caution. What will you be watching most closely during India’s 2019 general election? I’ll be watching two things in particular. First, turnout. There’s been much discussion of the decline of democracy globally. And while elections are not the only indication of democratic health, they can tell us something about how voters view their political systems and incumbents. In 2014, there was a record-setting 66 percent turnout in India. Will we see a repeat? What proportion of India’s 130 million first-time voters will go to the poll? What about female voters, who have been increasingly seen by political parties as a key constituency to target? Second, I will be watching to see what lessons the parties learn from the elections. The issues that they think resonate on the campaign trail can shape the policies they follow in office. The opposite is also true. Analysts think that one lesson the BJP has internalized—even though there isn’t definitive data about the link—is that they lost their reelection bid in 2004 because they were too focused on economic reform, and that that has shaped the party's caution in this regard in the Modi years.